New pedal captures the sound of Green Day frontman Billie Joe Armstrong’s classic guitar tone. 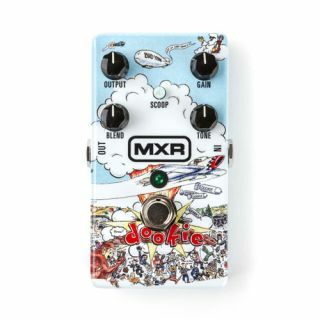 NAMM 2019: Following Billie Joe Armstrong’s tease on his Instagram page last week, Dunlop has officially unveiled the MXR Dookie Drive. The new unit is emblazoned with the cover art from Green Day’s iconic 1994 breakthrough album, Dookie, and looks to capture the sound of Armstrong’s amp on that album, which is believed to have been primarily a modded Marshall Plexi 1959SLP reissue that he had nicknamed Pete. The Dookie Drive will be offered for $189. For more information, head over to jimdunlop.com.